A signed art piece in a unique Art Deco design. Vintage Art Deco broach is framed by two black vintage plastic or Galalith pieces from Paris. 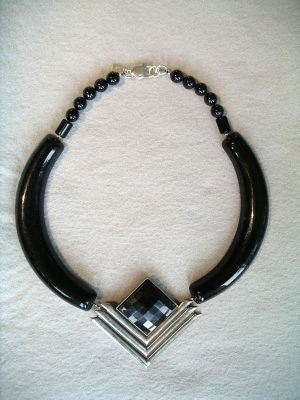 Black onyx beads and large sterling lobster claw clasp complement this piece. 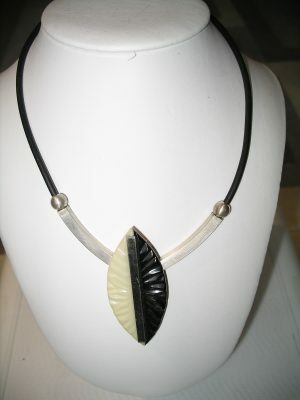 Original vintage 1930's/1940's black and white dress clip is the focus of this unique Art Deco inspired signed necklace. Black Euro rubber cord accented with sterling silver tubes, beads, and clasp. Pure silver impression of an antique Deco button. 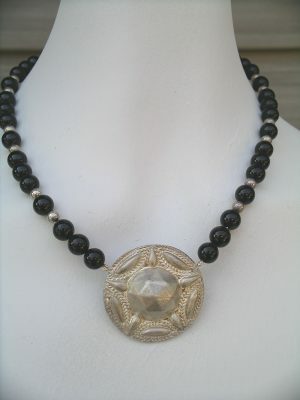 It is set off with black beads and silver clasp to make a unique signed necklace.